Email from a reader this morning…. CDF does its job and says Medjugorje is false, and according to this report Pope Francis over-ruled that and ‘saved’ Medjugorje. Sadly, it has a ring of truth about it. Ed: if you agree that the following report “has a ring of truth about it” tell us! “Chiara, look, it’s I who saved Medjugorje because the Commission of the Congregation of the Doctrine of the Faith, had already said, based on many news also false ones that Medjugorje is all false. 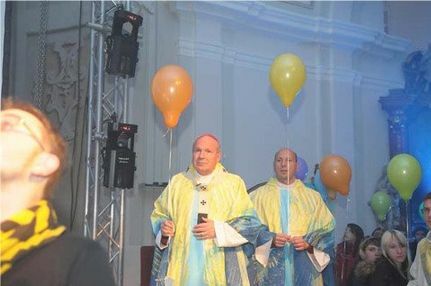 So it’s I who then saved Medjugorje, it’s I who sent [Archbishop] Hoser because I believe – what I also said in the press conference [on the flight from Fatima to Rome in May 2017] – that the fruits are many and unequivocal. You can say that I have Medjugorje at heart, and that I did not realise that that statement [about Our Lady who speak too much in Medjugorie] which I said as a personal opinion but which also was based in a wrong information, did have such an strong impact. « Does Music Help the Spiritual Life? Yes, it has more than a ring of truth about it. If he can’t even get doctrine right (Amoris Laetitia etc) how can we expect him to be right about alleged private revelations? This Pope is so caught up in the diabolical disorientation sweeping through the Church at every level, it makes perfect sense that he would ‘save’ a false apparition, while ignoring the demands made by a genuine one – i.e. the consecration of Russia, requested by Our Lady at Fatima. In fact, he’s even explicitly and publicly stated that the Russian Orthodox have no need of conversion, nor should we seek it. Our Lady of Fatima, Ss Jacinta and Francisco and Sister Lucia, pray for us. I agree about it having the ring of truth about it – definitely. It shows how two-faced Pope Francis is, saying one thing to one audience (like the “Lady” speaking too much) and then the opposite to another, in this case Medjugorje. He just can’t be trusted. “Preserve everything that is beautiful in Medjugorje”? He must mean all the money the Vatican receives from this scam. Well, Pope Francis, since you’re taking all the credit for keeping the snake oil show open, at least now we know who to blame, along with Balloon Cardinal Schonborn. Yep, he’ll never live that down, will he? I posted that same pic 2-3 years ago under an article by a sycophant, whose name I forget, who rhapsodized over the Cardinal’s :gravitas”! LOL! No, I wouldn’t buy a used car from Cardinal Schonborn and I’ve bought used cars from some shady dealers in the past, LOL! If it’s perverted, false, heretical, ungodly, fake, scandalous, irrational and downright evil, then it has Francis’ blessing (because it already has the blessing of the UN). I totally agree – Pope Francis seems to be programmed to go for the evil and present it as if it’s good. He really is a worry. What has the blessing of the UN? If you read RCA Victor’s post carefully, it’s really clear that he is saying “if”, something is evil, it has the blessing of the UN and so Francis’ blessing. Not just one thing, anything that is evil, in this case Medjugorje. Oops thanks, Lily! That’s my ONE big fault: speed reading….AND getting it wrong! Question. Do Popes never take a Holiday or maybe Francis is looking for a cut in the Stakes . Not that av been to any Grottos other than Carfin . But many people have told me that Medjugorie is not the Only Marian Shrine raking in the Money selling all sorts of items. (24 mars 2010 à 12h39) The content of the so-called “messages” conveyed by the false “Madonna” is completely oriented in the sense of “the great universal brotherhood” advocated by the lodges… Even the “gospa” plays on “the great fraternity” by letting herself to be shoved by excited pilgrims! What a vulgarity! Moreover, it is absolutely unthinkable that the Blessed Virgin, the true one, could be a “dividing factor within the Church” by exhorting the clergy and the faithful to disobey the Ordinary of the place and to revolt against him. This argument is, in my opinion, the most decisive to denounce this sham. I find it insulting to Our Lady that one dares consider that She can behave in such an ordinary and absurd way. Wow. Only a few people interested in this topic? The biggest hoax in the Catholic Church EVER, now ‘saved’ by a Pope, and only a few to comment on it? I’ve noticed that about this blog (apologies editor) but only certain topics are stowed out. Anything to do with the SSPX, it’s a packed hall, but most other topics are variable. Saying that, I’m late myself, LOL! I do read most stuff on here but can’t always get on to comment but this is important if the Pope is putting his weight behind this hoax, God help us all. There will be plenty of crowing going on among the Medjugorje fanatics. It’ll be worse than when they said Pope JP II wanted to visit the place but couldn’t. This is right up their street. It will also have the effect that in future, Medjugorjians will turn a blind eye to any of Pope Francis’s outrages, as they would want to keep him sweet, so that he will continue to ‘save’ their pet spiritual addiction. Somebody said up above that Pope Francis says one thing to one person and another thing to someone else. That’s marxism for you! No objective truth; just what fits at the time. This Pope is imbued with this philosophy, if one can call it a philosophy!